This interview that appeared in the June 2004 Living Buddhism, titled “Understanding the Diversity of the SGI.” Clark Strand is a well-known expert on Buddhism and a contributing editor of Tricycle Magazine. He has practiced many forms of Buddhism, including chanting Nam Myoho-renge-kyo. He is interviewed here by Masao Yokota, head of the Boston Research Center. Below are excerpts. 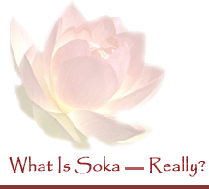 Yokota asked what motivated Clark Strand to write a Tricycle article ("Born in the USA — Racial Diversity in Soka Gakkai International” in the Winter 2004 issue of Tricycle) about the diversity of the SGI. Strand: I was interested in answering one question, “Why is it that the SGI is the only Buddhist organization in America that has achieved racial diversity?” But the obverse of that is the question: “Why have none of the other Buddhist groups achieved diversity?” So I had to address that too. I was interested in what the SGI was doing right that no one else was doing right, and I wanted to know how you had done it. That was my focus and I set out to discover the answers. It was sort of a journey. I had my own ideas about why it might be so. Many of those ideas turned out to be false. Yokota: Why has the SGI been so successful in achieving diversity? Strand: The Lotus Sutra is the primary reason. There is a theological mandate within the Lotus Sutra as practiced by Nichiren Buddhist for embracing diversity. It is found in its teachings of the absolute equality of all human beings. In Japan, where there isn’t much cultural or racial diversity, it had remained a theory. But in America, it had a chance to blossom into reality, into a fact. Because when the SGI came here, it encountered for the first time a truly pluralistic society. The thing that was finally so fascinating to me about the SGI was that it is in some ways the fulfillment of the American dream. Not just the dream of financial prosperity, but the American dream of freedom and justice for all people. The American dream that expresses religious tolerance and religious plurality. The SGI is not only the only diverse Buddhist organization in America; it might be fair to say it is one of the very few diverse religious organizations of any denomination in America. There are others but they are rare. I have heard it said that Sunday is the most segregated day of the week in America, meaning that when people go to their respective religious traditions, their churches, their synagogues, their mosques, they are basically segregated. There is little racial crossover, even within the same faith tradition. For example, the Baptists: There are black Baptists and white Baptists churches, but rarely do the two cross the color line in any significant way. Yokota: How was your experience of chanting Nam-myoho-renge-kyo? Strand: It was quite wonderful, really. In comparison with other chants I have done, it is very distinctive. The Nembutsu, for example, which is chanted by Pure Land followers, is a very sedate chant. By comparison, chanting Nam-myoho-renge-kyo is very lively and uplifting — less meditative absorption and more meditative participation. In general, Nichiren Buddhism seems to me to be a break from the monastic thinking and tradition that is so much a part of other Buddhist practices. When Nichiren began to teach it to other people there was a sense of its connecting directly to people’s lives, from one person to another. There was much more of an emphasis on lateral transmission in Nichiren Buddhism that there was on the lineal transmission from teacher to teacher found in other traditions. In Nichiren Buddhism there is of course great reverence for the figure of Nichiren, but to me it seems a more lateral-moving-tradition — spreading “sideways” from person to person rather than being handed down from on high by a master. I found this lateral sharing among equal participants a very inspiring aspect of the SGI practice. People act like Buddhism is something to be passed down from teacher to teacher. Too often, though, what is passed along is dead — a set of books or attitudes or beliefs or way of talking or an intangible “something.” But it is still dead when it becomes only formality. What happens in the SGI is that within the dead formality of traditional ritual, the living substance of that ritual is re-created from within by a person who chants Nam-myoho-renge-kyo. When they chant it, it is reborn again within them. Then what they have to pass along is living, not dead. But it can’t be passed along unless someone is willing, through their own chanting, to have it reborn within their own lives. Although I’m no expert on this practice, this seems to me that this must be what soka, or “value creation” means; this willingness to recreate Buddhism in each one of us, in each new life that receives it as it is passed along. One well-known Buddhist teacher said, “Trying to transmit Buddhism to America is like holding a seed against a rock and hoping that it would grow.” SGI has figured out how to make those seeds blossom into a beautiful garden of colorful flowers. And look how many different types of flowers it has! Yokota: Why do you think the SGI has been able to teach this chanting of Nam-myoho-renge-kyo to such a diverse group of people? Strand: I think it is no coincidence that the SGI began to develop into the global religion it is today about the time of its excommunication by the Nichiren Shoshu priesthood. I am not sure what it means for a very small religious body such as Nichiren Shoshu to excommunicate a very, very large organization like the SGI. They did it, but I’m still not sure I understand it. It’s like the difference between two types of vines. One vine, like the wisteria, grows out of the ground from one root. It can only cover so much ground. It can only grow so big because it is only one vine connected at one place of origin. Other vines put out floating seeds that are carried by wind and water and thus can spread much further and faster. The SGI became like that. Freed from restrictions, each place it traveled its seeds put down roots and growth happened. The growth was made authentic by the practice and faith of the people who embraced it. SGI members feel directly connected to the Gohonzon without intermediaries. Something not understood by people outside the SGI is the connection people have with the Gohonzon. I’m not so sure I understand myself, but I understand what I see. And I can see that it connects people directly to their own lives, through their own practice in there own homes, in a way that is impossible in most other traditions. As the expression goes, the SGI practice in America “has legs.” It moves and grows on its own. It is dynamic and active because it stresses conversion, the idea of kosen-rufu. Any place you put it, it takes root and spreads outward. Consequently, it attracts people who are dynamic and socially involved. Nichiren Buddhism as practiced by the SGI can’t help but be passed along because it is so vitally connected to real life. Yokota: Any final thoughts for our readers? Strand: Yes. What got me interested in the SGI was the book The Buddha in Your Mirror, written by three Americans. This was a very helpful book. But it wasn’t the book itself that got me interested. What interested me was the fact that three people authored the book. This would never happen elsewhere in American Buddhism, because Buddhist teachings in this country are still very personality driven. The Buddhist teachers in this country are in some ways almost like stars. To have a book written in cooperation by three people, whom I assume were sitting around and talking to one another and giving ideas back and forth and then producing a book together in cooperation – that was truly impressive. Later, when I started reading books by President Ikeda, such as The Wisdom of the Lotus Sutra, I found many others were written in dialogue format. I found all this so interesting because it was so much less ego-driven than the books I was used to reading. Quotes, articles and media from various publications and websites are used here in a "fair use" context.